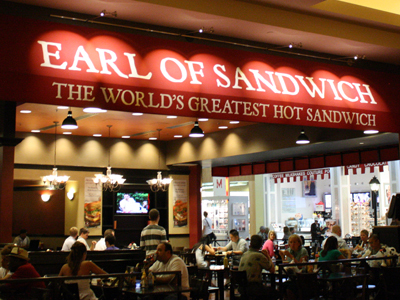 Welcome to the “World’s Greatest Hot Sandwich” at Earl of Sandwich in Planet Hollywood. Feast on an abundant variety of sandwiches created for your savory pleasure. Over 250 years of experience contribute to the masterpieces available for your enjoyment. Traditional family recipes brought to you in combination with roasted meats, sensational seasonings and the freshness of warm homemade artisan breads will keep you returning for breakfast, lunch, dinner and another stop before the night ends. Also offering salads, wraps and soups. A Kid’s Menu is available with a pizza sandwich, grilled cheese or turkey and swiss. Breakfast menu is served until 11AM. Open 24 hours. Sandwiches are cheap and tasty. Quick food. Great spot. Very convenient location, within planet hollywood. not big on sandwiches on vacation but wow! We finally decided to try a club sandwich at earl of sandwich last trip and it was the tastiest sandwich I have ever had. Decent sandwich, but not a whole lot for the price. I’ve had better sandwiches from firehouse subs and which wich!! This place has some of the best sandwiches. Way better than subway and has a quality bread product.